Gordon Matta-Clark cut up old buildings with a chainsaw. In 1974 he sliced a suburban house in half; in 1977 he cut teardrop-shaped openings in an office complex in Antwerp; in 1978 he bore circular holes through the soon-to-be renovated Museum of Contemporary Art in Chicago. All of these buildings were slated for demolition, and Matta-Clark capitalized on their demise to make his sculptures. As such, none of the artist’s ephemeral projects exist as they were made; one can only imagine what it might have been like to stand inside the cut-up structure and look down a hole through several floors below, or through telescoping holes in the walls that pointed skyward. The collapse of inside and outside, ground and floor, was no doubt a dizzying experience, creating a view of architectural space like an architect’s nightmare. While fragments of the buildings are collected and exhibited, such as shingled roof corners or wall-papered drywall, it is the artist’s photo-collages that really capture the sensation of eye-tripping in a wholly new way. The photo-collages are not merely documentation, like most performance photography, for they mirror the experience of falling down the stairs, or of a foot momentarily upended by a lapse of gravity. It’s a struggle to see exactly how one room flows into another. Useful architectural design—bedroom, office, hallway—is destroyed. These three-dimensional exercises in deconstruction glorify apocalypse culture and violence, which were problems in Matta-Clark’s decade as well as ours. They also respond to specific problems of gentrification: what part of the old city will be forgotten when the new concrete is poured? Matta-Clark’s practice is often referred to as “cutting,” similar to a behavior found in adolescents with deep psychological problems. Self-inflicted, physical wounds bring traumatic pain to the surface. For cutters, the bloodbath replaces stranger pains. In Matta-Clark’s hands, destruction never looked so elegant. The view of the city and its architecture is also at the heart of Caroline Picard’s collages. Here, a bird’s-eye view of highway interchanges and telephone wires serve as curvilinear arrangements, and layers of sharp-edged, colored cut-outs add up to a view from a vibrant stained-glass window. Art-historical references abound: shards of Futurism’s visionary modernism spin and glow; Robert Delaunay’s lyrical jazz aesthetic throbs and wails. Picard makes use of the city’s readymade Cubism, its jagged angles and swirling mobs, but like Henri Matisse’s paper cut-outs, never quite reach full abstraction. Here the head of the Hancock tower peeks out and there a Hokusai wave sputters forth. Where Matta-Clark sought to give form to emptiness in his city, Picard sees it filling up and blooming. 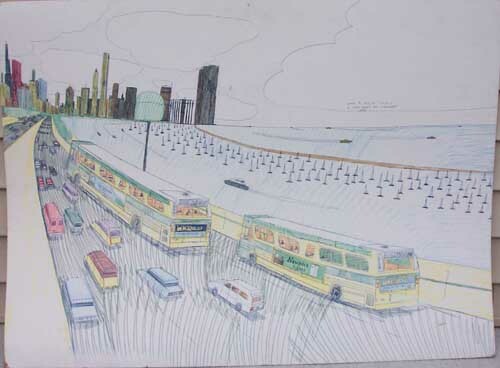 Perhaps no one exemplifies a taste for the skyline more than Wesley Willis, RIP. Alongside Matta-Clark and Picard, Willis’ view is the most traditional and straightforward. As is well known, he often perched atop freeway overpasses and sketched with colored pens. Buildings are rendered in simple cross-hatching, and the eye is led swiftly along highways and railways into downtown Chicago. Willis didn’t seem interested in early Chicago architecture, such as the quirky ornamentation found on the Fisher building or the subtle, graceful curves of the Monadnock. Rather, he preferred to move his hand in the straight lines of iconic modernism, all latitudes and longitudes, up and down, side to side. In this rote gesture he is caressing the city, and his respect for its thrust toward streamlined progress is apparent in every line.